Is the Future of Retail Un-Deliverable? You’ve seen them and maybe even visited them – possibly more often than your pocketbook can accommodate. This expanding retail category is about experiences, a commodity that can’t be shipped digitally, in brown/white/blue delivery trucks, or by drone. As the “retail apocalypse” continues to thin the herds of mall anchors and tenants and cause “for rent” signs to proliferate on commercial streets and shopping districts, establishments that provide a unique entertainment product are demonstrating market viability in a difficult period for brick-and-mortar retail. Even restaurants – a tried-and-true destination retail staple – face growing competition from make-at-home meal distributors like Blue Apron and on-demand food delivery juggernauts like Grubhub and Uber Eats. Same goes for markets, where browsing for the ripest tomato can now be done by a gig worker who drives it to your house in a matter of hours, or less. Just about anything that can be bought in a store can now be purchased online or through an app. 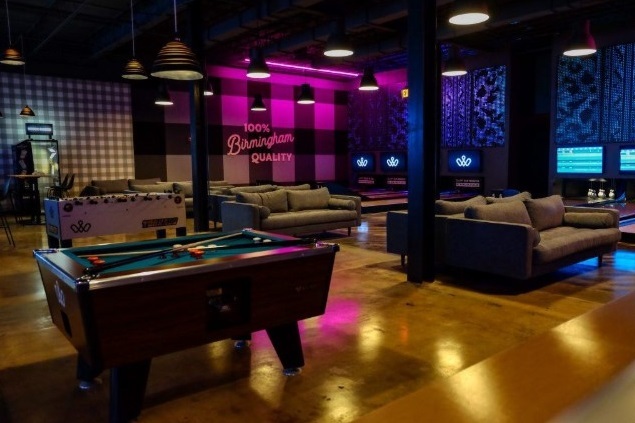 Entertainment retail centers (ERCs) and family entertainment center (FECs) offer a “delivery-proof” experience that’s just hard to mimic despite the size of your home gaming console and big screen. It’s also about community – the chance to meet friends and strangers in an environment conducive to shared encounters. If you can get a booze buzz, all the better. Hence the happy hour specials at Dave and Busters, Topgolf, and other ERCs. For families, buck-toothed staple Chuck E. Cheese has been joined by play centers like Monkey Joe’s and Sky Zone trampoline parks in the battle to empty your wallets and your children’s energy tanks. Smaller footprint hybrids like “Barcade” (bars with arcade games), active-game bar/restaurants like the buzzy Woolworth in Birmingham, and other models are also finding success with patrons looking to spice up the typical night-out experience. 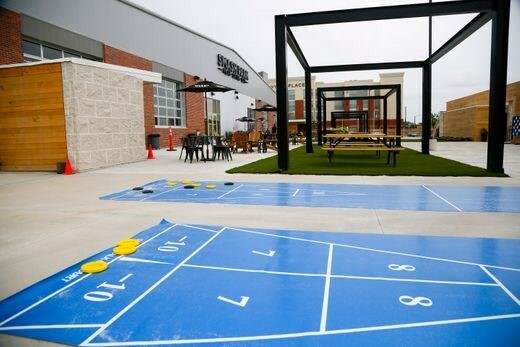 For kiddos, restaurants are equipping outside space with play areas to lure families and birthday parties. During a recent trip to Austin for a wedding, we were drawn to the Hat Creek Burger Company like moths to a char-broiled flame. It’s not just chains that are finding success. Local centers like Smash Park in West Des Moines, Iowa and Two Bit Circus in Los Angeles are examples of entrepreneurial ERC/FEC plays. Importantly, entertainment centers are becoming substitute anchors for malls that have lost their department store tenants and represent desirable new-build options for developers looking to fill thousands of square feet of retail space. The ERC/FEC category typically features floorplates of 15,000 to 50,000 square feet and can even go larger. Even with new centers opening rapidly, experts feel the FEC market is far from saturation and will continue to expand. Allied Market Research estimates the global FEC market size at $18,907 million in 2017 and projects it will rise to $ 40,814 million by 2025, a combined annual growth rate of 10.2 percent. Economic developers must stay abreast of the new trends roiling the retail landscape and connect property owners and leasing agents to investment prospects in the ERC/FEC market. As technology continues to blow up the retail paradigm, the health of a community’s tax base – especially those dependent on sales taxes – will increasingly be tied to opportunities to create destination experiences that can’t be matched by the click of a button.